Scotland has her castles. India her spice markets. What does America have that is uniquely American? Well, I’d have to say, it’s the American Wild West and her exquisite National Parks. Now, guess which American small town allows your family to experience the best of these two national treasures at the same time? That’s right, Big Sky, MT is a small striking mountain town with a great Wild West vibe just outside of monumental Yellowstone National Park. As an International transplant myself (born and raised in Singapore), I was absolutely thrilled….giddy thrilled by this uniquely American experience. I’ve driven across the US 3 times, and visited 36 states, and I have to say, Big Sky is one of the most beautiful places in the country. It is a land graced with majestic mountains, carpeted with evergreens, and topped with staggering, often snow capped peaks. The tallest being Lone Mountain, home to Moonlight Basin Resort and Big Sky Resort. It is an impressive 11,166 ft. high. (Insert here all sorts of superlatives and they still don’t do her justice.) Meandering through these pine-covered ranges are pristine rivers and creeks that rival the beauty of the Swiss Alps. I remember watching “A River Runs through It” when I was a teen, vowing to myself that one day, I would visit the America I saw in that film. I relished ever minute of our stay at 320 Guest Ranch where we settled into a cozy cabin on the banks of the pretty Gallatin River. The Gallatin River is serious business for the many fly fishermen who line its banks during the summer. But, even if you’re casting that fly for the first time and never catch a thing, spending a day on this pretty river is golden. River rafting and float trips are also popular along the Gallatin River and there is no short supply of rafting operators around Big Sky. In the winter, Big Sky is a mecca for extreme skiers and snowboarders looking to conquer some of the most challenging terrain on the continent. However, in the summer, this slice of American pie entices families to slow down and savor her beauty that western cowboys have been inspired to wax poetic about for hundreds of years. There are 3 dude ranches in Big Sky where you can book an all-inclusive stay and soak in the full cowboy experience. We visited Lone Mountain Ranch for a few hours during our quick visit to Big Sky. My boys (6 and 9) and I saddled up on horses and explored the forested foothills of Lone Mountain. 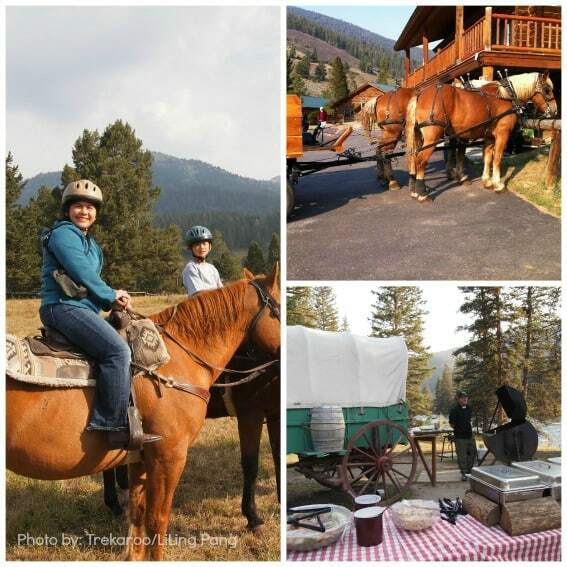 There truly is no better way to enjoy summer in Montana than on horseback! The gentle clipety-clop drew us into the soothing rhythm of the forested hills. We took deep breaths of syrupy fresh pine, giggled with the bubbling creek, and felt rich at the sight of the morning sun bouncing of majestic mountaintops. It was one of those surreal moments where I had to pinch myself. Was I riding through a National Geographic magazine? Guests at Lone Mountain Ranch are treated to rides just like this for an entire week. 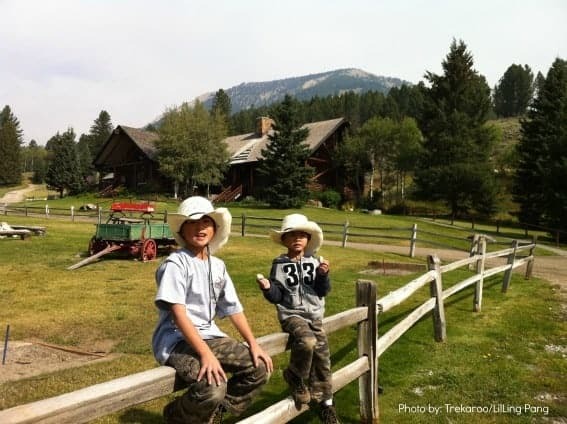 Families come here for the premium ranch experience. Gourmet meals, the best of Wild West living, and a fantastic youth adventure program in the summer for kids 4-18 promise families a week they will never forget. In addition to riding, kids have a packed itinerary of fun activities like high ropes courses, canoe trips, archery, and more. In the winter, the horses at Lone Mountain Ranch take a vacation and guests snap on cross-country skis and snowshoes instead to explore the extensive 85km of trails. If you’re not quite ready to commit to an all-inclusive dude ranch experience, 320 Guest Ranch offers visitors dude ranch a la carte. You can pick and choose what you want to do and pay as you go. Just want to do one horseback ride? That’s all you pay for. Want to eat dinner at one of the great restaurants in town or at the ski resorts, that’s not a problem. If you want to enjoy a hayride and a chuck wagon cookout at the banks of the gushing Gallatin River, anyone is welcome. What you might not know about Big Sky is that it’s only an hour away from the west entrance to Yellowstone Park and under 2 hours to famous Old Faithful Geyser. The route along Hwy 287 to Old Faithful Geyser is also one where you’ll pass some of the park’s top attractions like Prismatic Hot Springs and Fountain Paint Pots. We took a day trip into Yellowstone National Park from Big Sky and my boys were full of oohs and ahhs. Their eager anticipation while waiting for Old Faithful to blow her top was replaced by the most priceless expression of awe at her impressive 80-foot spray. My boys were so engaged with everything they saw, they might as well have had question marks growing out of their head. They eagerly read each interpretive signboard explaining the geological formations they were seeing. I too had a blast learning along with them. 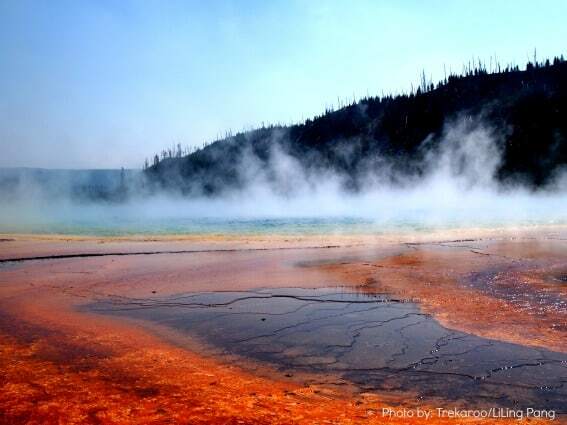 Who knew that bacteria could be neon yellow and rusty-red, and that under a geyser is an underground chamber of water? If you don’t have your own vehicle, there are several companies offering tours into Yellowstone National Park from Big Sky. Want to travel in style? Yellowstone Luxury Tours has plush vehicles and fully customized tours with experienced guides. Yellowstone Alpen Guides also got strong recommendations from the locals for their small group tours with excellent interpretative guides who go the extra mile to engage kids. Big Sky has certainly earned her reputation as a premier winter destination but she sure isn’t like other ski resort towns where there’s barely anything to do in the summer. In addition to all the wonderful hiking, horseback riding, fly-fishing, and whitewater rafting to be enjoyed, I was impressed with the variety of other summer activities available. There are several family-friendly golf courses in Big Sky, most are private and for members only, but the one at Big Sky Resort is open to the general public. July is family golf month at Big Sky Resort where kids play free after 3pm with a paying adult. But if mom and dad want a game of golf on their own, Big Sky Resort’s kid’s club is open throughout the summer. 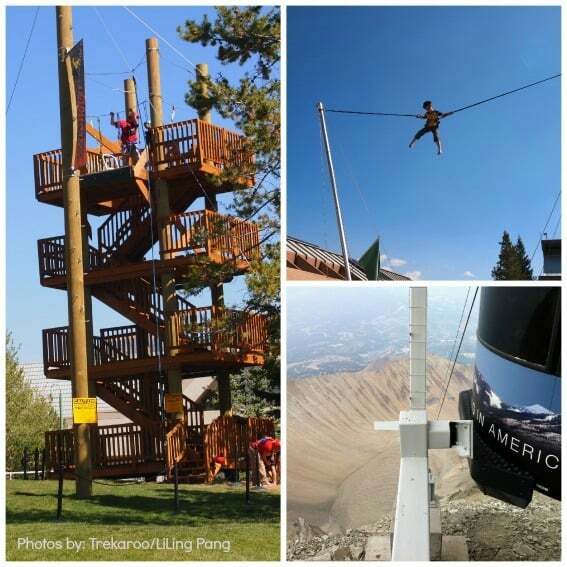 The Basecamp area at Big Sky Resort also offers some fun experiences. A splurge on the new summer tram ride up to the top of Lone Peak was knee-knocking fun! Not only did we enjoy 360 degree panoramic views of the area, the journey up was just as thrilling. In the first leg, you ride up the Swift Express chair lift, which is not for anyone with a fear of heights. Next you jump into a Safari jeep type vehicle and ascend the mountain further to the base of the Lone Peak (also called The Bowl.) There, you board a tram that climbs up the steep face to very tippy top of Lone Peak. My boys were deeply impressed with the steepness of the Big Coulior, a double (or was it really quadruple?) black diamond run. I, on the other hand, was praying that the daredevils inside of them were not getting any crazy ideas about attempting that mountain one day. If you’ve got toddlers or preschoolers, keep them really close. Back down at Big Sky’s Basecamp, families were finding other thrills on the zipline, giant swing, and mountain biking down the usually snow covered ski runs. Little ones were squealing on the bungee trampoline and rock wall. There is also a small mini golf area, archery range, and a few other amusements. Here are some more great kid-friendly activities in and around Big Sky! Big Sky as a summer outdoorsy destination is quite unique. Since it’s such a big ski destination in the winter, there is an abundance of great accommodation options in the summer offering fantastic summer deals. You’ll find anything from ranch style one or two bedroom cabins at 320 Guest Ranch and Bucks T4 with kitchenette facilities, to large luxury mountain homes and hotel rooms with full room service at Moonlight Basin. Our room at The Summit in Big Sky Resort has awesome views and the most comfortable beds. We loved having access to several different swimming pools at the various buildings as well as great gym facilities, and a spa. How many outdoorsy destinations can boast this variety of family-friendly accommodation at off-season rates during the summer months? I wish it didn’t take me such a long time to get to Montana with my kids. I was delighted to discover recently that you can fly direct to Bozeman, MT (just an hour drive from Big Sky) from 14 different cities including San Francisco, Seattle, LA, Las Vegas, Newark, Chicago and Atlanta! There are several shuttles to Big Sky from Bozeman if don’t want to rent a car, including Big Sky Taxi with great service and comfy new taxis. 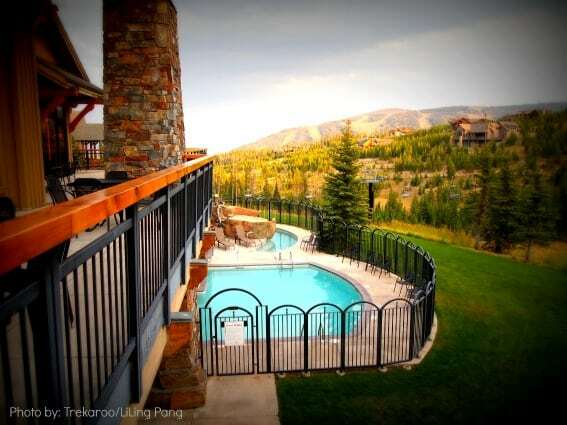 Check out additional hotel recommendations for the Big Sky area! Looks and sounds amazing. Montana is just amazing! Now I can’t wait to visit Big Sky someday! Thanks Trekaroo. Counting down the days until the summer season! 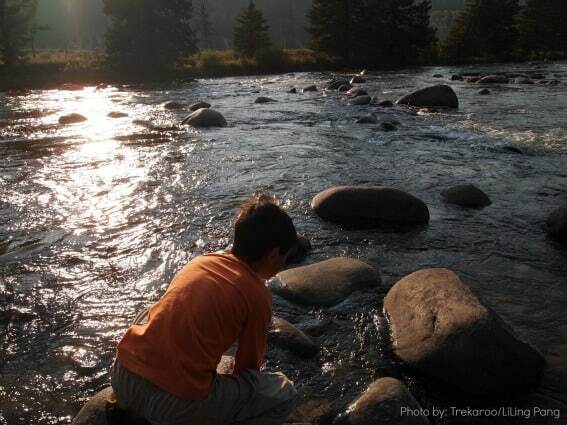 Let us know the next time you and the kids are in Big Sky country. I was looking for blogs about Big Sky to share on our site and I came across your post…If you’re open to it, shoot me an email at jane(at)dwellable(dot)com.